As the HIV prevention field continues to evolve, appropriately evaluating the potential advantages of MPT products becomes more complicated, and opportunities for the progression of MPTs through full development to commercialization may be limited. 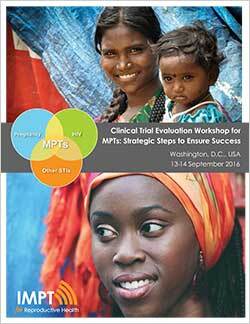 The Clinical Trial Evaluation Workshop for MPTs brought together MPT stakeholders with the goal of informing an overall strategy for the successful clinical evaluation of MPTs. Participants outlined strategies for successfully addressing challenges and risks, and identified critical market issues that can be addressed through clinical evaluations of MPTs, or through the study of intended target populations. van der Straten, A. How can we optimize adherence to products before, during and after phase III trials?